“Draw Mohammad (PBUH) day” on Facebook is going to have a material impact in my opinion as it clearly highlights major points ranging from the attitude of social media stakeholders to the importance of technological advancement in a community. I see three angles to this issue: 1) Impact of “Draw Muhammad Day “on muslims, and 2) Attitude of Facebook with this issue, and 3) The opportunity raised by this religious issue. PART 1) IMPACT OF “DRAW MUHAMMAD DAY”: I do not know what religious scholars have to say about this so I am not going to comment on that. My question is it causing any harm to our Prophet (PBUH)? The answer is NO! Then why are we behaving so emotionally? Don’t you think we should be taking all this sensibly rather than getting heated driven by sheer emotions? Do all those protests in your country have any impact? Those against Islam know how emotional we can get and that is all they are taking advantage of. They want to enrage us by planning such events and we, driven by our emotions, do as they expect us to do. Isn’t it time we start using this organ called brain rather than the overused heart? A: Drawing pictures of our Prophet (PBUH) will not cause any harm to him. B: I believe that this strategy to “Hurt Muslim Emotions ” will bring more good to Islam than before. Such events only lead to curiosity among people. In the past, such events lead to worldwide popularity of the person involved, take any case. Kids and people belonging to other religions would be asking questions like “Who this Mohammad (PBUH) is?”, “Why is he so important to Muslims?”, “What kind of a guy was he?” This is my point! The more they spread such things, the more the world is going to know about Muhammad (PBUH) and this effectively is a WIN-WIN situation for us. Instead of getting furious, start posting links to information about Mohammad (PBUH) on the “Draw Mohammad Day” page. Make a Facebook page named “Know Mohammad (PBUH)” and invite people to it. Run marketing campaigns on Facebook to bring this page to every possible user’s news-feed. You have a variety of options ranging from pay per click ads to Facebook advertisements to social media marketing. And since we know how complete and admirable our Prophet (PBUH) was, we are surely going to get people’s attention towards him. Once they read about him, the sensible ones might stay away from such activities in future out of respect, few might convert to Islam and some may still not refrain from such activities. This, I think, is the right way to go about this. Answer: No! Because we all will again be using Facebook on the 21st. The attached table clearly shows that avoiding Facebook for one day will not make any difference to Facebook. Since data regarding muslim Facebook users was not available, I had to take the proxy of users in muslim countries. 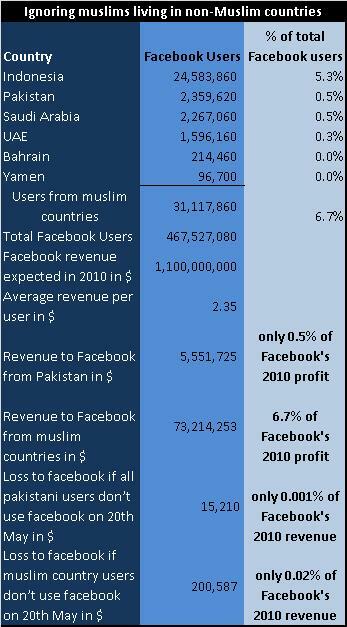 The data clearly shows that if PTA blocks Facebook in Pakistan, it will only be 0.5% of Facebook’s 2010 revenue. Plus, if all muslim users living in muslim countries avoid facebook for one day, it will only cost facebook 0.2% of total revenue. Small isn’t it? Then how should one condemn it? Answer: Facebook earns most of its revenue through adverts (advertisements of different things which appear on right side of facebook page). If you want to make Facebook realize their mistake, rather than discontinuing using Facebook (for now), just approach all the Muslim advertisers and ask them to stop showing their adverts on Facebook for some time. This is pretty easy. Click on each advert, it will take you to the relevant link or Facebook page. Now, on the contact us page (if it’s a website) or fan page (if it’s a Facebook page), write a generous note mentioning the bias of Facebook and request them to take off their adverts from Facebook. Now this needs some time and effort but if you really condemn the prejudiced nature of Facebook, then doing this should not be a problem for you. If you are successful with this, Facebook is going to get the real blow. And this is the only way to pay Facebook back. Boycotting Facebook for some time or blocking it in your country for some time is not going to hurt them. PART 3) OPPORTUNITY HIDDEN IN THIS EVENT > HIGH TIME FOR MUSLIM SOFTWARE DEVELOPERS: The problem with us is that we do not respond the right way to any such event. We only end up expressing our agitation by abusing and getting angry, which is of no help to us. The right solution to events like these is to find a practical remedy. For example, we had a problem that international media is spreading disinformation and bad image of Muslim community. In response to this, the idea of having Muslim media was evolved and led to channels like Peace TV. If we have capable Muslim developers then we have the right solution to all this as well. If you effectively want Muslim advertisers to stop advertising on Facebook, provide them another effective platform. This idea might sound unrealistic to some, but not to those who know how little ideas like orkut/facebook/twitter ended up being one of most important part of internet. I believe this is one of the major triggers which have highlighted the need of a Facebook replica website for Muslims. If you guys have the skills to make a Facebook lookalike platform for Muslims, I believe this is the right time to go for it. Why? Because a) With Facebook leaving such a dark mark on every every Muslim’s heart, all Muslims will definitely move to the “Muslim Facebook” if you provide them the same product, b) Many Muslim businesses, venture capitalists and country religious departments will willingly provide initial funding for such a project, and c) if lots of Muslims leave Facebook, all businesses (whether Muslim or non-Muslim) will need your platform to advertise their products (thus providing you with the revenue streams). Now there is a “catch” and a “question” to this. The “catch” is the Muslim Facebook should at least have all the features of original Facebook (if not better than that) because no one is going to move from Facebook if you do not provide them with the equivalent product. And the question begs “Do muslim developers have the skills, heart, time, devotion and love to make something like this?”. Till the time we start acting on real measures against such events, I am only left with one choice; Boycott Facebook on the 20th of May. That is what I am going to do! But it’s only a consideration to condemn Facebook’s bias. And if you think such events like “Draw Mohammad Day” hurt my feelings or my Prophet (PBUH)… No Sir! I was searching for the best answer for this issue, and if you dont mind i will be quoting you on different platforms. I totally agree, it is not the time to get emotional and but our heart at work, rather its the brain which should be put at work rite now. But sir, now that PTA has blocked it till further notice, what do you expect out of it? Is this going to affect the facebook profits? Or if facebook decides to shut the page down? Then what do you analyse, will it give an impression on its profits by enraging the non muslim users? nice thought! I feel blocking whole fb wil nt serve the purpose. Instead, boycoting forever the html basd version of fb is gud, n if u r dying much to use it, use m.facebook.com its realy safe, n wil nt generate a single peny to fb. Escaping frm isue is nt a solution. n btw, protest is a part of freedom of speech, v shuld do it in a peaceful manner. Protest can b done an e-way 2. @osama: well even if PTA blocks the Facebook for whole year, it on average translates to only 0.5% of facebook’s 2010 profit. This is not even 1%. Sadly, what PTA did really depicts the immaturity of the nation I belong to. Its just like the pigeon which closes its eyes when a cat approaches to eat it.